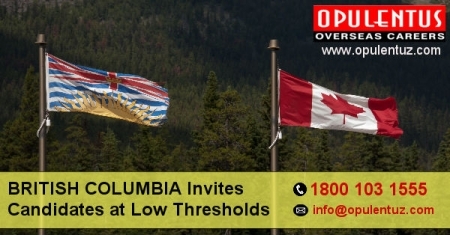 Low point’s thresholds have been noticed in immigration draws held by the Government of British Columbia consistently. Many workers, entrepreneurs, and graduates received ITAs for a provincial nomination for the BC PNP after two draws were conducted on September 27th and October 4th. 377 invitations were issued over this period, which included applicants in the Tech Pilot program. BC PNP categories are overseen through Skills Immigration Registration System. For applying in this eligible candidates must open an account, and they are given a score which is based on credentials covering economic and human factors. High scoring candidates are invited after conducting a draw. These categories require candidates to have a job offer from an employer based in the province. Candidates who are invited through Express Entry Aligned Sub Category can apply now and get an enhanced PNP Nomination Certificate. When the nomination succeeds applicants receive 600 additional points under the CRS and an ITA in the future draw in the Express Entry pool. ITA under the Provincial PNP is dissimilar from the ITA issued in the federal Express Entry. The invitees will see their PR applications processed outside Express Entry after they receive a nomination from BC. Eligible individuals interested in applying for immigration to Canada in a few categories of provincial PNP must enter into the SIRS pool. Here they are given points based on their status, education received, work experience gained, and some other factors. The Express Entry Skilled Worker category of the province is designed for skilled workers internationally. They must have post-secondary education/training and experience of being employed in a professional or managerial, technical or trade-related skilled occupation. They must fulfill eligibility conditions of entering the federal Express Entry pool. Success under this category gives 600 points under the CRS and an ITA at the federal level. International graduates who have passed the graduation from Canadian universities/colleges in the last two years are eligible to apply for the International Graduate positions in Express Entry BC. It is open to graduates who have graduated from any location in Canada besides British Columbia universities and colleges. It is aligned with the federal Express Entry system. This category is meant for workers having post-secondary education/training and employment experience in skilled occupations. A job offer is compulsorily required. International graduates who have passed the graduation from Canadian universities/colleges in the last two years are eligible to apply under the BC PNP. The candidates are not required to have any prior work experience, but obtaining a job offer from a provincial employer is compulsory. This category belongs to candidates who are not eligible for appearing in other immigration programs. It allows non-skilled workers to apply for PR. They must work in an occupation in the tourism or hospitality, trucking, or food processing industry or an occupation listed in NOC skill level C/D based in the Northeast Development Region. This stream shows a path to Canadian PR for businesspeople with experience who are in a position to establish themselves in the province and invest in it. They must also perform in a commercially viable business that provides benefits to the economy of the province. Successful applicants get a work permit and, after fulfilling certain requirements they can apply for PR through the BC PNP.